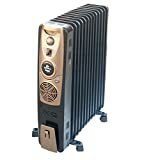 Buy the Best Room Heaters and Oil Heaters in India - Top 10 In India - Only The Best of everything! LATEST product list, updates regularly! Still trying to decide on a room heater this winter? When winters come, you need a room heater if you are living in Northern India or in a hilly area. There are many types of room heaters, ranging from convection heaters to infra red heaters to oil filled heaters. The most common type is the regular room heater that either has a coil that heats up or has a blower to disperse the heat from the heated element. Just make sure that you buy the right kind of room heater as per your room size. The simple rule is that the wattage of the room heater should be 10 times the size of your room in square feet. Thus a 100 square feet room needs a room heater whose wattage is 100 X 10 = 1000 watts. Also go in for a heater that haws auto power cut off when the required temperature has been reached. This is a good safety feature and also ensures that overheating doesn't happen. Since most of the regular room heaters heat the air, it becomes quite dry after a while. You can think about keeping a half mug of water in one corner of the room so that there is a comfortable level of humidity in the room. These room heaters are what the most number of Indian have already chosen and tested. You can go ahead and choose any one of them and you can be sure that you will get a good and robust product that will deliver quality and durability. Choose one of the room heaters here and check out its features and budget. If everything is fine, just go ahead and buy it. 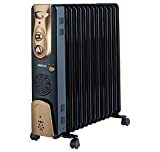 If you are thinking about buying a room heater, then this is the best place to find a good room heater for your needs. 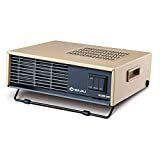 This definitive guide to room heaters has been created with the Indian consumer in mind and takes you step by step towards the goal of finding the room heater that is best for your home or office. Though India is by and large a warm nation, winters can get quite cold in the Northern parts of India and in fact in any lace that is at a height. Whether the Himalayan foothills or the Western Ghats. 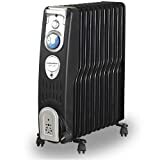 With a room heater in the house you can be sure that the bitter cold of winters or an especially cold evening will not bother you. 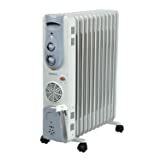 In India a wide variety of types and brands of room heaters are available to buy online and in most markets. The basic principal in room heaters is that they have a heat source which generates heat through electricity, and then this heat is spread out into the surrounding areas to give warmth to people who are nearby or within that room. With the increase in demand, manufacturers have come out with better and better room heaters that are energy efficient and sleek, and most importantly affordable. With each passing year the room heaters are also becoming more compact and lightweight. 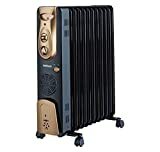 This guide will help you to select the best room heater from the multiple options available, such that it meets your needs and uses the best technology while delivering optimal performance. 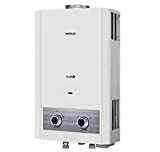 With a plethora of types, designs and manufacturers, it is important to get your essential requirements in place so that you get to the best room heater within your budget. We cannot divide the type of room heaters by a single parameter, but it makes sense to look at them on the basis of two parameters - heating method and type of room heater. Let us look at heating method. The heating method of a room heater is independent of the type of room heater it is. You may have several types of room heaters using the same heating method but one type of room heater can have only one heating method. Let us first look at the main heating methods that are found in room heaters today. There are essentially three methods of generating heat in room heaters, by Convection, Conduction and Radiant. In a Convection heater, there is a heating coil or panel. A fan inside the heater then blows air towards the heating coil or panel, and this hot air heats up the surrounding area. This kind of heating requires a blower to blow the hot air and circulate it. In the conduction method of heating, electricity passes through a heating coil that heats up, glows red and starts to give out heat. This is the coil heater, which was once upon a time the most common heater in Indian homes. The heat of the red hot coils then slowly spreads around and heats up the room. In Radiant heaters, infrared technology is used. Through infrared rays, the heat is transferred to different surfaces around, be it our skin or clothing or any other surface. 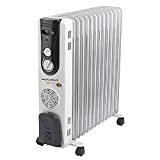 In this type of a heater, the heat stops as soon as the heater is switched off. The air does not become warm like in the other two types. The type and variety of heaters available in the market is mind boggling but we can classify them into eight different kinds. These different kinds of heaters may be using the same heating method but their process, technology and components will differ. Let us have a look at the different kinds of heaters available to buy online today. These heaters have a fan that blows air over a heated coil or panel, and this warm air is blow outwards into the area. This warm air then heats up the room and makes it warm. This kind of heater cannot be kept on for a very long time as it will dry up the air and is also considered unsafe to keep on all night. Oil-filled heaters have fins filled with oil, and an electrical element heats up this oil, which then dissipates the heat all around. 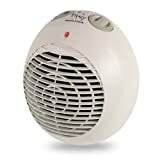 These are very safe and warm the room without making the air dry or creating any kind of allergic or other discomfort. These type of heaters use infrared heating, and heat up solid objects and material that is in the path of the quartz heater. That means, the quartz heater will not warm the air around but only people and things that are in front of it. In this kind of a heater, the regular heating coil is replaced by a halogen coil. 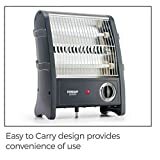 This kind of a halogen bulb heater uses less energy than conventional heaters and is even found in oscillating models which spread the heat around. These kind of heaters use infra-red technology to radiate heat. The infra-red heater does not heat the air around but it heats any slid surface that is facing it like human skin, furniture etc. No part of this heater become hot to the touch and it is relatively safer than regular blowers. These heaters use ceramic chips as the heating source. When electricity passes through these ceramic chips, they heat up very rapidly and emanate heat. Also these ceramic chips reach a plateau at a pre-defined temperature and do not get any hotter, making the PTC heater a safe and energy efficient heater. The heat convector type of heaters have heating coils inside them that heat up any air that comes in contact with them. This warm air rises and is replaced by cold air, and in this continuous cycle they heat up the entire room evenly. PTC ceramic heating element, heat supply is faster, heat dissipation surface is larger, and heat energy consumption is reduced. When the temperature is too high, the temperature limiter will automatically cut off the power to avoid accidents caused by abnormal high temperature. Practical PTC heater uses the most advanced PTC heating system and has a longer service life than heaters using other heating systems. No potential safety hazards In order to avoid serious accidents such as fire or electric shock, ceramic heaters use the latest safety technology. If they suddenly fall or fall, the equipment will immediately shut down. As winter is approaching and the temperatures are coming down we begin to bring out our heaters from different corners of the house. While they are working most of the time, sometimes they need to be repaired. 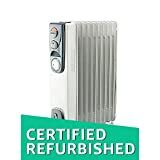 However every heater has a lifespan and beyond a certain point even if you repair it, the room heater will not give you good service. And that is when you will decide to buy a new room heater. Of course you may be buying an extra heater or a heater specially for this winter. Frankly, no one wants to feel the bitter cold of winters. In most Indian homes, the most common heater is the standard room heater either with heating coils or a blower. If you want greater comfort and don't really want the hassles that come with a coil heater or a blower then of course you can go in for an oil-filled heater. The oil room heaters are more expensive but they are definitely worth every rupee (we’ll come to that later). 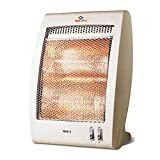 There are many different types of room heaters you can buy online in India, from stores like Amazon and Flipkart. A huge advantage is the option to return a product within 30 days of buying it, which I know for a fact Amazon offers with a written in stone guarantee. 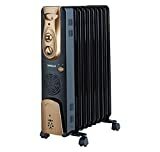 Since a room heater from a well-known brand will rarely turn out to be a problem, it makes a lot of sense to buy one online. Not only will you get a lower price there is also the convenience of shopping from the comfort of your home and getting it delivered right at your doorstep. Having said that, there is some value in actually going to a shop and checking out the heaters yourself. 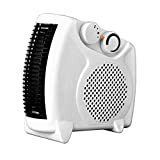 If you have a good idea what kind of heater you want for your home, then go right ahead and buy from a good online store. The convection heaters are the regular heaters that most of us buy and already have in our homes. 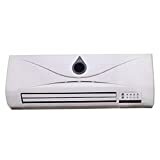 They are good heaters that are designed to warm up rooms efficiently. These usually have heating coils and also come with the option of air blowers to disperse the heat. The convection heaters work by heating the air around it. When you turn a convection heater on, the electricity heats up the coils or wires or ceramic elements in the heater, which in turn heat the air around it. They take a little time to become properly warm but are quite efficient and even after you switch them off, the warm air will remain in the room for some time. These do not cost too much and are a good option for most houses. These are by far the best heaters that you can buy. Not because they heat fast or more, but because they can heat large areas and safely stay on for long periods of time. They are very safe and do not have any hot component that can cause an accident with kids or pets. The basic principle of oil filled heaters is that the heater has several flat hollow metal fins (ranging from 6 to 12 usually), which are filled with oil which are heated up and then radiate the heat all around. Essentially the heating element is surrounded by oil, which gets heated up and then that heat warms the surrounding area. Our recommendation is to go in for an oil filled heater. They have many advantages including low electricity consumption. Since they have been bought and tested by hundreds if not thousands of discerning Indian buyers, and they are updated every day, you will get the most popular and the latest only. And finally as always, choosing from Top 10 in India means you get a great balance of quality, value and reliability. Go ahead, choose the oil heaters that most Indian trust. Here are the top 10 best selling room heaters this winter, by brand. Go ahead and choose the one best suited for you and your family. A household name for nearly a century, presenting room heaters from the brand you can trust. The brand believes strongly in excellence through innovation and this is reflected in the room heaters from Orpat as well. A leader in home appliances worldwide, Morphy Richards believes in smart ideas for your home; also reflecting in their best selling room heaters. 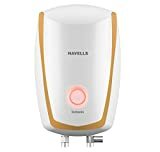 Havells is characterised by a strong global presence and world class quality, which is evident in their room heaters. 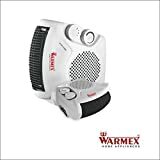 Top 10 Best Room Heaters in India 2017 – The smartest and quickest way to find the best products. Daily updated Top 10 lists. Look, Choose, Buy Smart! Quick heating. Easy to operate. Overheat protection. Power: 1000/2000 watts. Operating voltage: 230/240 volts.